How do you effortlessly blend authentic, impromptu speaking with a powerfully prepared speech, presentation or workshop in front of any group? Follow up the gentle 6 week confidence program for nervous speakers, Confidence & Connection Ebook, by learning how to tap into your new found confidence to craft a compelling & meaningful message with Crafting & Presenting EBook. Troubleshoot audience questions and handle challenging people and situations. 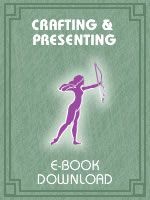 Crafting & Presenting Ebook shows you how to develop presentation skills with short stories backed up by examples and practical exercises. An extra bonus is the inclusion of Templates to help you create your own presentations. Crafting & Presenting is a low cost, fast download and available immediately. Crafting & Presenting is the second book of the Free Your Inner Speaker Series, a companion to Confidence & Connection Ebook. You can buy Crafting & Presenting Ebook (50 pages) as a stand-alone self-study course for $65.